Mega Sale! Free Shipping Included! 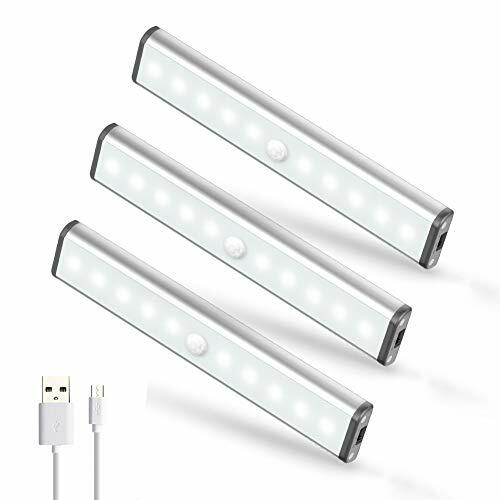 Save 21% on the USB Rechargeable 10 LED Under Cabinet Lights, Okeanu Stick-on Anywhere Portable Magnetic Motion Sensor Light Auto On/Off Sensing Night Light Lamps Bulb Lighting Bar(3 Pack Silver) by Okeanu at F LED Lights. MPN: WXP-light-1. Hurry! Limited time offer. Offer valid only while supplies last. The latest version: Removable & USB rechargeable, energy-saving LED light, 3 different ways keep it instant on or off, or make it motion activated. The latest version: Removable & USB rechargeable, energy-saving LED light, 3 different ways keep it instant on or off, or make it motion activated. camping light, bedside lamp, reading light and so on. Easy to use and install: Because of the magnet residing inside, you can directly attach the product to any iron surface, OR stick the iron material attached to the LED light to a non-iron surface using 3M adhesive stickers. When you need to charge it or change its location, you can take it off anytime. 6000-6500K daylight(white light),100 lumen illuminations.Comes with 1 YEAR WARRANTY by Okeanu,refund or replacement without asking. If you have any questions about this product by Okeanu, contact us by completing and submitting the form below. If you are looking for a specif part number, please include it with your message.